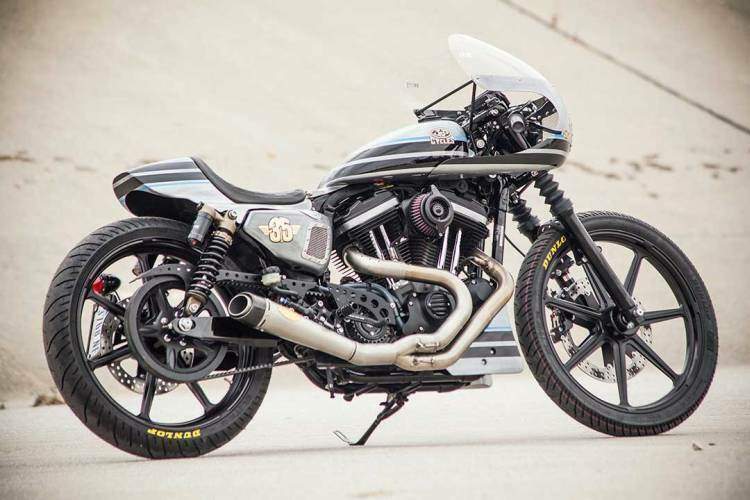 This neat custom Harley-Davidson Sportster was built by Roland Sands Design for J&P Cycles. 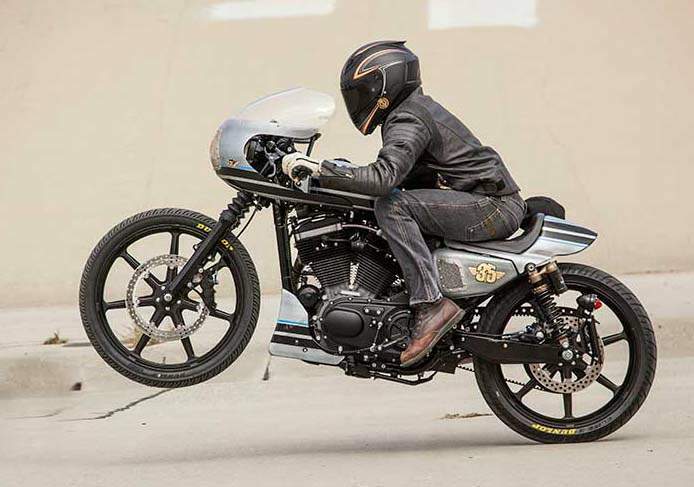 Roland himself has written up a brief on the build, albeit a very unique one with the bike itself telling its story! Some said I was just doing what I was built to do. They’d say I was strong, made in America with American hands. That I could handle just about anything, and to tell you the truth I did. And if you’d told me I was going to get a complete redo I wouldn’t have believed it. But I’m living proof, anything can happen and it probably will. I’ve got a new lease on life and nothing would make me happier than heading down the road at a rapid rate of speed, wind blowing across my freshly painted fairing, vintage gas tank and custom tail section. I got a whole bunch of new parts to show off including the Blunt Power Air Cleaner, Tracker Front Pulley Guard, Rearsets, Nostalgia Rocker Box Covers, Radial Gas Cap, Slant Exhaust, Vintage Headlight Bezel and Morris Wheels just to name a few. I just have to get used to people staring at me, I’ve never been one for attention. But these days, it just comes natural. Just keep me out of the burnout pit, that’s just plain old abuse. So I showed up at the RSD shop a little worse for the wear. Those boys at J&P did a number on me. Plain old abuse is what I call it. Yea, I’m used to it. Being the eternal step child to who ever happened to have my keys had its ups and downs. Occasionally it would just be a nice ride. Other times It would be pure flat out punishment. After one of these episodes, my electrical system was damn near fried to a crisp. 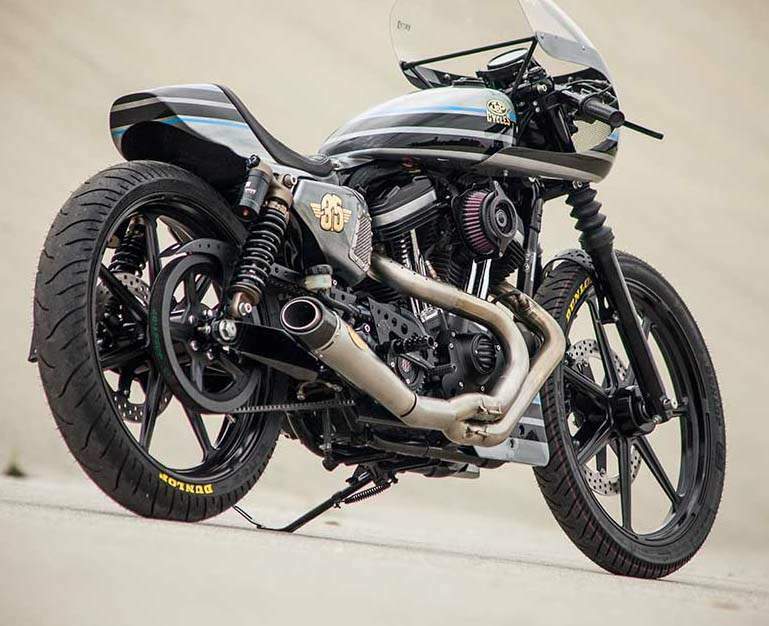 As the paint on my rear fender began to bubble and peel beneath the lava hot melting rubber, a small inferno in my rear section began melting away wire sheathing exposing my delicate internal fibers. A bike can’t live like this man! Why is no one going to jail? So now this guy named Roland and his merry men of transformation have stripped me clean. I had no idea what I was in for. I’ve heard the mumblings about bikes getting cut up, pure surgery, so I was a little sketched out to tell the truth. But man, I got my own damn fairing! And the burnt-up rear fender, it’s gone brother, replaced by a custom tail section. I hear there’s a seat coming as well. And these new 21” Morris wheels in Black Ops finish are joined by rear sets, a new stainless steel exhaust, clip ons and paint from Airtrix.